I AM VERY PLEASED TO ANNOUNCE THAT MY PHOTOGRAPH ENTITLED "DESERT CLIMBER" TOOK 1ST PLACE OUT OF OVER 6,000 IMAGE SUBMISSIONS FROM OVER 28 COUNTRIES THIS YEAR AT THE DRONESTAGRAM AND NATIONAL GEOGRAPHIC DRONE PHOTOGRAPHY CONTEST. 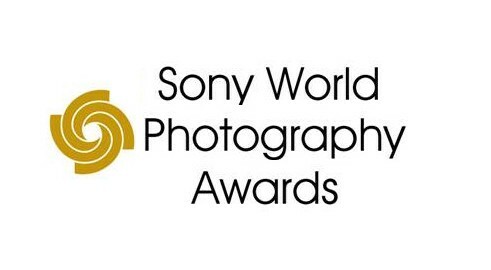 THE COMPETITION WAS JUDGED ON CREATIVITY AND PHOTOGRAPHIC QUALITY BY A PANEL OF EXPERTS INCLUDING NATIONAL GEOGRAPHIC PHOTOGRAPHER KEN GEIGER (PULITZER PRIZE-WINNING PHOTOGRAPHER) AS WELL AS JEAN-PIERRE VRIGNAUD, EDITOR IN CHIEF OF NATIONAL GEOGRAPHIC FRANCE AND DRONESTAGRAM. 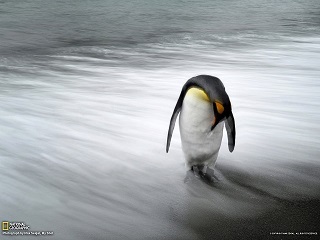 The 2013 National Geographic Traveler Photo Contest recieved over 15,000 submissions from countries across the globe. I am pleased to announce that my photograph entitled "Looking Up" took first place in the 2013 Destinations Travel Photo Contest hosted by Digital Photo. I am pleased to announce my image entitled "Canyon Spirits" won First Place in the Shoot The Land International Photography Award contest in October, 2013. The 2013 International Photography Awards received nearly 15,000 submissions from 103 countries across the globe. I am pleased to have received fourteen awards in this years 2013 IPA Awards. Five of my images won second place in the Nature: Other category, four won third place in the Nature: Landscape category, and five received honorable mention in the Special: Night Photography category. 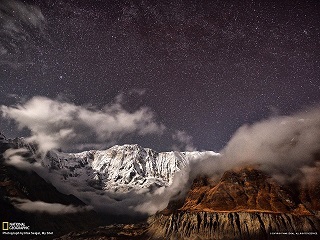 I am pleased to announce that my image titled "Annapurna Stars" was commended in low light category of the 2013 Sony World Photography Awards. This year's contest attracted more than 122,000 entries from 170 countries. I am pleased to announce that my image entitled "Looking Up" received honorable mention in the Connecting People and Nature category of the 2013 National Wildlife photography competition. There were over 32,000 image submissions to the contest this year. 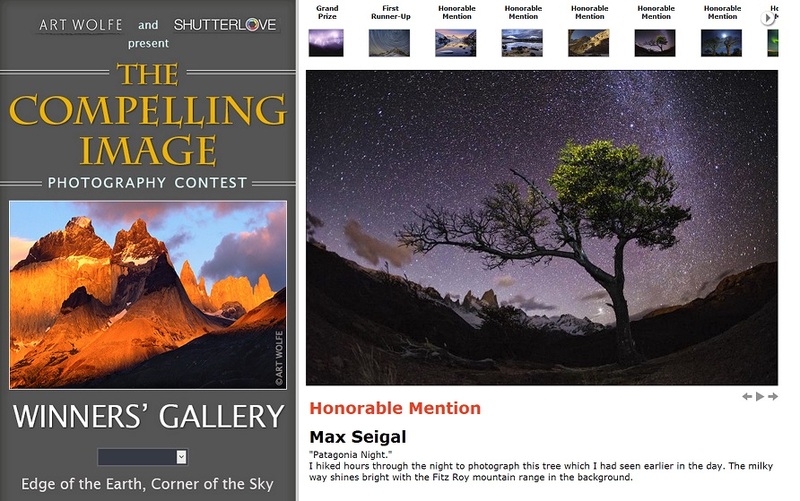 I am happy to announce that my imaged titled "Patagonia Night" received an Honorable Mention award in the 2013 Compelling Image contest hosted by legendary photographer Art Wolfe. I am pleased to announce that my image titled "Moonrise over Wildebeest" recieved highly honored awards in the 2011 Natures Best Photography Contest and was published in Natures Best Photography Magazine. Over 25,000 images were submitted from countries around the globe, and it was a great pleasure for me to recieve this distinction. It was a pleasure working with Africa Geographic and having my article on Black Footed Cats published in the April 2011 issue. I was fortunate to be a researcher on the Black Footed Cat project in Kimberley, South Africa for several months. I learned a great deal about the species and spent a lot of time tracking them in the field, which allowed me to write up this article and include several of the images I had taken during those months of work. 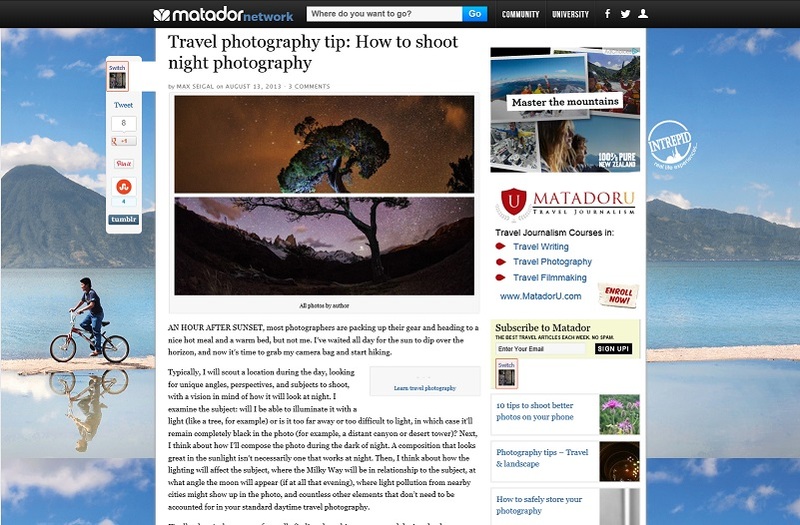 It was a pleasure working with Backpacker Magazine. 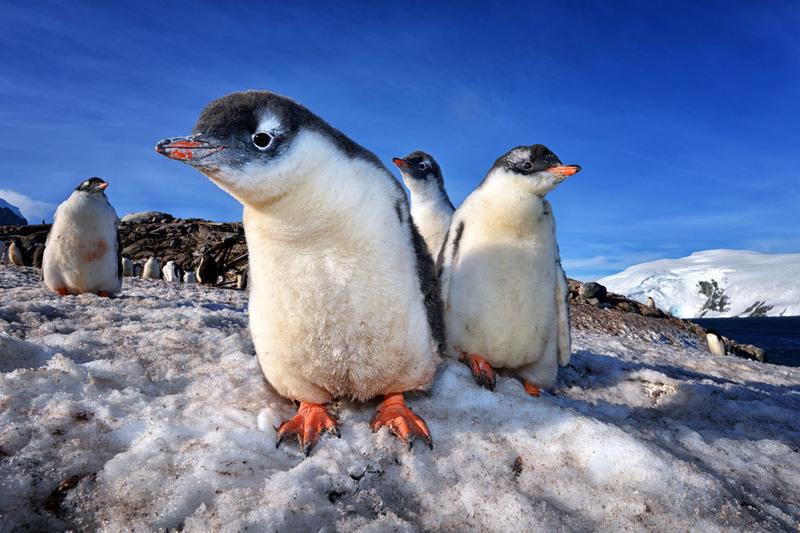 We published a brief article on Antarctica, including one of my penguin images. 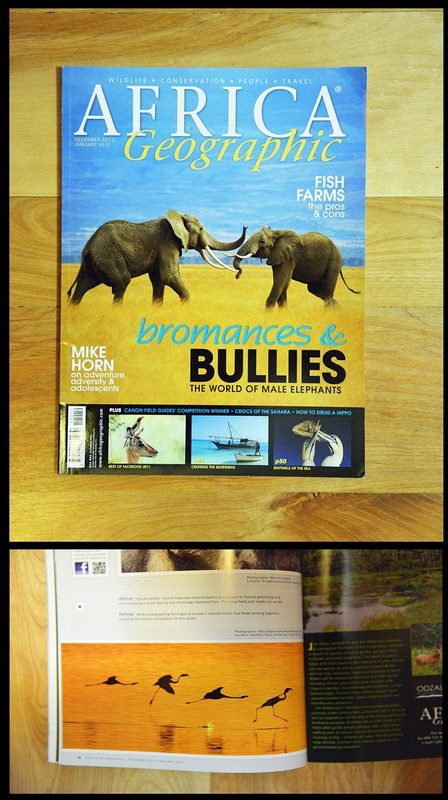 It was an honor to have my image published in the January 2012 issue of Africa Geographic Magazine.